The color is just not quite right here. It is just fine in Photoshop, and, as usual, Blogger has shifted it a bit. It is brighter in person, but at the same time, darker. Much like a tornado, I suppose. I just stole these words from one of my previous posts. which is impossible to buy in this town. If it's not rectangular, it's not on the shelves. so alas for the dragonfly. no doubt ready to be freed to the wonderfulness of gesso & new paint. and the blocking of space. So back to that for a bit in a few paintings. 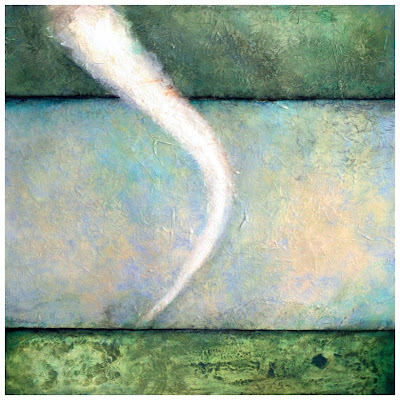 Labels: art, mixed media, painting, tornado. ELK - Thank you. I've taken that image out & replaced it with one that's a bit duller, but probably closer to the real thing. I consistently have a problem with Blogger reproducing color correctly; I'm not sure what's up with that. I usually just over color correct for it in Photoshop & that fixes the problem, but sometimes I just can't get there. But yes, it was that green sky feeling I wanted - with the blue sky still visible. You know what I mean. i can see the magic of the color in the middle block of space. I can imagine it's far more beautiful even in real life. wish i could come to your show. i know what you mean about the color problems with blogger. i think it's especially hard when you try to reproduce art work - paint colors and textures theat are so subtle. Love it! I would love to see the real thing up close and personal...I've always wanted to be a storm chaser. The coloration is outstanding on this one. Quite peaceful, which is interesting when you think of the motif. Oh I have been waiting to see this piece! I love it! And I am with Christy...I have always wanted to see a tornado for real...at a safe distance of course, but they are so powerful and beautiful, and the skies are usually the most incredibly intense colours. This is beautiful Debi. Your paintings always make me want to touch them. Does that sound strange? They are simple, yet very intricate and rich in texture. I think this is a lovely painting - I can't paint for toffee myself. Beautiful. Probably the closest i'll ever get to a tornado too as I live in the UK and they are rare here and small if they do happen! Your work is lovely, lovely. one day i am going to visit here with a cup of tea and read every single post---your words and images are so soulful, honest and as relyn said, lovely, lovely.